10 Comments on "Ruins of Ancient City Discovered in Australian Desert"
Why do some of you have to be so horrible and rude? Everyone’s entitled to their opinion, even if you don’t agree with it. Just saying. Those early civilised people were my great(x10)-grandparents, and I hereby claim the land known as Australia as my sovereign domain. You may all be grateful and kneel before me! 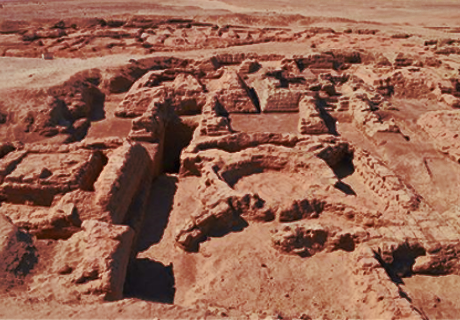 Strange that the same image purports to show an ancient civilisation in Sudan. Is it April 1st already?? And the bowl is actually an artifact from Mapungubwe in South Africa. One Word…. Atlantis. I’ve read enough about it to know a big part of it was off our coast so it was probably that tribe. Doesn’t matter who was here first, we all have two arms, Two legs and a Heartbeat. It’s all of our responsibility to look after the planet so what does it matter what Race they were? It’s interesting all the same. So much for dear leader, who only last week, in trying to educate us all, managed to deeply offend every person of aboriginal descent, and most persons of any other, by planning a grand statue of Hotham, stating that the day that he and the first fleet arrived was the day that this land began to become the great nation it is now. Indigenous people were designing and building this city when Abbott’s ancestors were running around clothed in blue woad! !